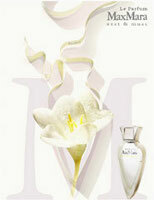 Max Mara will launch Le Parfum Zeste & Musc, a flanker to last year's Le Parfum fragrance for women. Le Parfum Zeste & Musc was inspired by the "refreshing" top notes of Le Parfum, and is a more transparent fragrance than the original. The fragrance notes include bergamot, mandarin, magnolia, ice accord, nutmeg, freesia, datura, white pepper, lime tree wood, cedar and musk. Max Mara Le Parfum Zeste & Musc will be available in 30 and 90 ml Eau de Parfum, in a bottle with the same shape as the original Le Parfum but with a white finish and a satin band wrapped around the side. (via deurocos.ch). Other recent launches from Max Mara: Kashmina Touch. I thought the original Le Parfum was already “transparent” enough as it was – it smells very light and subtle to me, and on my skin fades away to imperceptibility within the half-hour. Forgive my ignorance but what is datura? This sounds crisp, if the lasting power is good, I may try a sample. As long as I'm educating myself what is transparent? We grow them — they smell lovely! And transparent means sheer, light. Thank you Robin. Another question: I thought silage meant lasting power. Erin said that Cruel Gardenia has bad silage. But CG last all day on my skin. Also in here, I guess I'm wondering what a *skin scent* is? And is silage what other people smell? or is it what is left in your wake? Thanks Robin also for the link. Sillage means the trail of scent you leave behind you, powerful sillage means people can smell you from a distance, close to the skin means they can't. Skin scent is a more amorphous kind of thing — hard to explain but often people mean something that seems to “meld” with your skin and smell like “your skin but better”, if that makes any sense. I think that's why I love Cruel Gardenia…and, some critics I found out are over the moon about it too. This makes me feel much better about loving something so vilified. I don't think the silage is great either, but that's o.k. because it definitely IS a skin scent. It's seems so personal. It seems to become part of my skin and I feel like I have been kissed by an angel, and it became a part of me. I could wax poetic about it all day. It is a good thing the silage is minimal because it really does make a great wedding fragrance, a lot of sights list it as such (The perfumed Court, for one). It doesn't smell like any flower in creation but maybe in Heaven. Listen to me go on, I better get a few mils. before I perish. Thanks, You've clarified so much Robin …Viva la Cruel Gardenia! LOL — you really better get a few mls!